That inquisitive nature stayed with Shafik through her study of economics at UMass Amherst, to her graduate degree at the London School of Economics (LSE), and PhD at the University of Oxford. “It took me a long time to get educated,” she laughs. The LSE is ranked among the top three universities in the United Kingdom, just below Cambridge and Oxford. It is one of the world’s foremost universities for social sciences and particularly notable for its global focus, which suits Shafik, who is Egypt-born and holds American and British citizenship. Sixty-nine percent of its nearly 12,000 students come from outside Europe. Its graduates and teachers include 18 Nobel Prize winners and 37 world leaders. She enrolled in classes at Smith, Hampshire, and Amherst Colleges offered through the Five College Consortium and, as a member of the honors program, had a course in which she read books recommended by professors in a variety of disciplines. “It was a great opportunity to understand what ideas influenced people’s lives,” she says. “I read books I wouldn’t have found on my own.” Those included Walker Percy’s The Message in the Bottle and The Souls of Black Folk by W.E.B. Du Bois. Her UMass studies taught Shafik that social upheavals, such as the nationalization that brought her parents from Egypt to the United States, have political and economic solutions. After graduation, she returned to Egypt and worked in rural development. From there, she went to the London School of Economics for her graduate degree in economics and then to Oxford for her PhD. She next worked for the United Kingdom’s Department for International Development, which oversees global aid for the U.K. in over 60 countries. She managed a massive budget and a staff of thousands, again with the goal of reducing world poverty. From there, in 2011, she became deputy managing director of the International Monetary Fund, where her work was dominated by the eurozone debt crisis and the aftermath of the Arab Spring. “At that point, I got very good training in managing crises, which is the bread and butter of central banking,” she recalls. 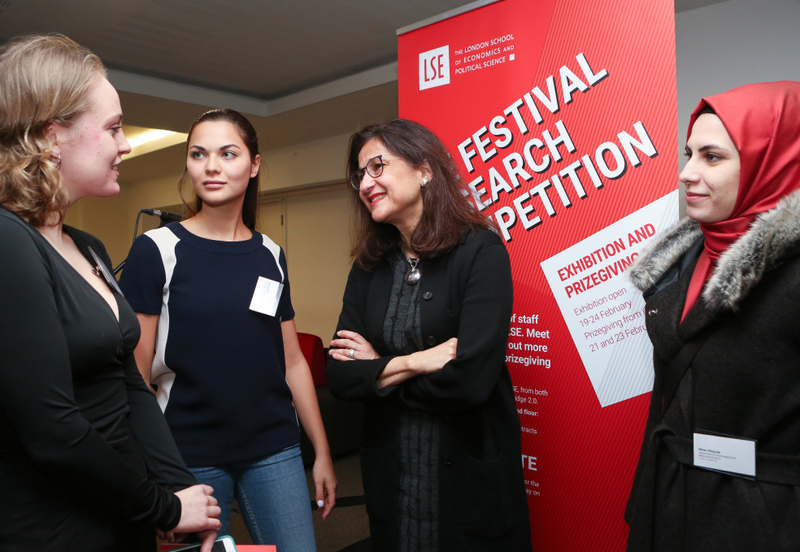 Holding the sticky door open for young women: London School of Economics Director Minouche Shafik with LSE Festival research prizewinners. Last year Shafik left her high-ranking post at the Bank of England for the London School of Economics. Encouraging the open debate that is an LSE hallmark, in February she was a featured speaker at a university festival focused on the future of the welfare state. “Many of the problems we see in today’s very divided society are because the systems we have for people who are either hit by economic shock or face a personal shock that sets them back are not working anymore,” she says. “We need to rethink the welfare state to make it suitable for the 21st century.” Shafik’s global economic perspective and decades of leadership in rocky times have prepared her to take on that challenge and many more to come at the LSE and to be a highly respected voice in global affairs. She presented a plan to heal our fractured societies at the 2018 World Economic Forum in Davos, Switzerland. Shafik shoulders her heavy responsibilities with remarkable equanimity. She says that during years of stressful jobs in Washington, D.C., and London, she has always found being outdoors relaxing. One of her favorite spots in London is Hampstead Heath, with its green rolling hills, meadows, and ponds. Raising children also keeps her grounded. She has 15-year-old twins (a boy and a girl), as well as three stepchildren in their 20s. “You can come home from work with some huge crisis that you’ve had to deal with, but when your kid needs help with their homework or needs their sports kit for P.E. tomorrow, it helps put everything in perspective,” she says. Nemat Shafik (everyone calls her by her childhood nickname, Minouche) is the first UMass graduate to be named a dame of the Order of the British Empire. Granted the exceptional opportunity to talk to an alum with such a penetrating intellect and vast experience tackling global crises, UMass magazine asked Dame Minouche some big questions. Is civilization making progress or racing toward self-destruction? That is a big question! I have worked on developing countries and poverty issues, which helps to answer it. When you have that perspective, there is absolutely no doubt that we are so much better off than we were 20 or 30 years ago. People are living longer across the world. Incomes have risen; rates of extreme poverty and hunger have declined. The number of conflicts in the world has declined. If you look at that broad historical perspective, we are much better off than previous generations. I do think the last couple of years have felt more gloomy because of the legacy of the financial crisis of 2008 and the political consequences of that crisis. And social media has changed the nature of public discourse. We have less common space as societies, and, ironically, that makes us feel more isolated, more alone, more divided from others. Hopefully, this will be a time in which we will think of new ways to reconnect our societies and the ties that bind us. We all need to do our bit to try to overcome this very unusual period in history. In these turbulent times, can you give our readers reason to be optimistic about the future of the world? In every place I have worked, I have met committed and capable colleagues who want to do good in the world. In the end, what makes me very optimistic is to think about all those very passionate people. You’ve been in demanding jobs dealing with nerve-racking situations, including humanitarian crises, the eurozone crisis, the Arab Spring, the consequences of the fall of the Berlin Wall, and the Brexit vote. How do you sleep at night? I don’t panic; I’m a planner. For me, preparation is one of the best ways of dealing with stress. I just put the energy into planning and thinking through all the options and what we would do in different scenarios. When you feel well prepared, you feel confident and capable of coping with almost anything. On a lighter note, what are the privileges of being a dame commander of the Order of the British Empire? The queen is getting on a bit, so Prince Charles pinned a medal on me at a ceremony at Buckingham Palace. You get this title, which I don’t use very much, to be honest. You can use it on your card or to make dinner reservations. In theory, you’re part of an order—in the olden days, it would have been an order of knights. If you get into trouble, the other knights will come and protect you. I must say I haven’t taken them up on that.